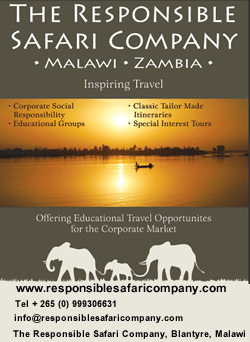 I am the Founder and Director of The Responsible Safari Company, a small travel company based in Malawi, striving to bridge the fields of development and tourism within Africa. Our core aim is to ensure the benefits of tourism reach local communities, providing a platform for national residents to benefit as much from tourism as the international visitor. Is this an idealistic view? We are yet to fully establish this, but we are constantly critiquing this issue to ensure that what we are doing is both responsible and sustainable within the developing environment that we work in. My partner and I started thinking about starting the company while we were running high-end ‘eco-lodges’ in East Africa. Then I was completing a Masters in Education and International Development and the bush environment, with its limited resources, was a far cry from the London University library. During our time in a lodge in Uganda, I undertook a research study on the effects of tourism on the community living adjacent to Lake Mburo National Park and became fascinated with the relationship between tourism and rural African communities. Now living in Blantyre-Malawi, and selling the ‘warm heart of Africa’, we find ourselves constantly questioning what are the implications of tourism on rural communities? Can tourism truly be ‘eco’, and if so, what are the actual impacts on rural communities? Are we trying to sell something that exists only as a Western concept, and if so, what are the responsibilities of doing that? How we sell African experiences has always interested me. Do we market our experiences honestly, and is what we are selling really ‘untouched’, truly ‘Africa’s best hidden secret’ and are people really coming to ‘tread in the footsteps of the first explorers’? As tour operators within the field of responsible travel, we are constantly questioning our marketing methods, the ideals we have about Africa and the way we do business. We want to keep Africa ‘a pure experience’ for our guests but we also support development initiatives. We have seen that often through development comes a potential loss of the very image that attracts people to this wonderful continent; the search for people who are living simple self-sufficient lives. We seem to want to freeze time and development while at the same time striving to develop communities. As tour operators, we strive to show guests areas that do not have children begging for money and instead show them communities living in harmony with one another. Should we want to preserve these communities with their seemingly ‘simple lives’ or should we be trying to support the development of these communities with community based ecotourism initiatives- or is it perhaps not in our place to meddle at all? Will we always strive to keep little ‘unexplored’ pockets, so we can sell them to people who are looking for those ‘off the beaten track’ experiences? As we search for more remote and endangered corners of Africa, it could be said that we are feeding environmental and cultural exploitation. Maybe as ‘eco-tourism’ spreads, it is important to question who is really benefiting. If a community once lived and relied on land that today has thousands of tourists spending money to see it, is it a resource that has been taken away from them, or an opportunity to promote development within rural communities and thus provide a way out of the poverty cycle through tourism development initiatives? Since the Romans arrived in Egypt in 2000BC, the African Continent has always attracted ‘tourists’. From the first explorers through to the Big Game Hunters, people have come to Africa in search of undiscovered places and ancient cultures seemingly simpler than their own. Post Independence and with pressure from ecologists, many governments set up tourism and wildlife ministries and as wildlife reserves were gazetted, tourism boomed. The first National Parks were heavily critiqued as a form of ‘Fortress Conservation’- a playground for colonialists to hunt big game, where wildlife was confined, and local people largely excluded. Package tours brought fresh criticism and the tourism industry began to realise that they were destroying the very nature of what they were selling, the ‘untouched wilderness’ was becoming harder and harder to find. Local communities had often lost land with little compensation or benefit from the tourists who passed by daily to view the wildlife they had often lived alongside for generations. The industry hence reacted and sustainable tourism initiatives began to surface. With this new wave of tourism has come a traveller who demands more knowledge and who asks more questions, in particular when travelling to developing countries. Eco-tourism seems to be the buzzword amongst these travellers and is now often generalised as ‘good tourism’, and ‘mass tourism’ tends to be known as ‘bad tourism’. However eco-tourism in particular is a term that can be misunderstood, possibly because it is used as an umbrella term for various tourism activities. Unfortunately all too often it is used for marketing purposes rather than genuinely sustainable tourism initiatives that have long term benefits for local communities. The Eco Tourism Society’s definition of eco-tourism is ‘responsible travel to natural areas that conserves the environment and improves the well-being of local people’. However, conserving the environment and improving the well being of local people would seem sometimes an unavoidable clash of interests. By conserving the environment, are we always improving the well being of local people? For example, through the gazetting of National Parks, is it more beneficial for a local community to have small permanent plots of land and rely on donations from park entrance fees or use the land nomadically to graze their cattle and trade with other local communities? I am not being idealistic or questioning the need and worth of conservation initiatives, I am merely trying to highlight that the question of dependency and the true benefits of tourism and conservation for local communities should be considered. We truly believe that tourism can bring sustainable development and act as a route out of the poverty trap that so many Africans live in. However, we are also aware that it is hard for all to benefit, so when we get excited about finding another hidden gem in a remote corner of Malawi we try to look around, establish who was there first and also who will be affected by our being there. The research I undertook in Uganda suggested that tourism can bring many developments within a community and greatly increase its economy and infrastructure but it can also breed dependence and a loss of the community’s indigenous economy. Greater wealth often brings greed and without careful handling this can lead to less reliance on one another and instead leave communities with greater disparities of wealth and basic needs than was there before. As you join the bumpy, windy road through the hills to the shores of Lake Malawi and the beautiful bay of Cape Maclear there is a sign that proudly says ‘tourism improving welfare in Lake Malawi National Park.’ Visitors to Cape Maclear have created a market for curio sellers, hotel employment and local boat trips to the shores of Lake Malawi and this in turn has brought a degree of development. However, there is not enough tourism to supply the growing number of ‘tourism services’ on offer. Instead in some areas, populations along the lake shore have grown up so quickly, possibly through the hope of prosperity from tourism that the natural resources of the lake have begun to dwindle. Local communities continue to grow and the quiet idyllic lakeshore is becoming harder to find. As a company we seek for the areas of the lake that still remain ‘tourist free’ for our guests to relax on the beach and watch the local fishermen mending their nets (we are lucky in Malawi that these wonderful areas still exist). However, in time, when these areas are ‘discovered’ and tourism moves in, will we keep moving away to find newer more remote areas; will we always strive for more wildernesses? My family’s house in England where I spent my childhood is on the East Coast and adjacent to a protected area of marshland. My father always used to say to us; ‘I wish they would keep the road a dirt track and not fill in the potholes because it keeps all the visitors away and we can enjoy it all to ourselves.’ Does the travel industry have this effect on local developing populations? Are tour operators adding pressure to fragile environments or are we providing opportunities for development and ensuring areas like Lake Malawi National Park are protected from the effects of mass population growth? If so, are we then providing the correct support for communities when tourism comes knocking at the door? We believe education is a key component to providing sustainable travel experiences and our company compiles tailor-made educative information packs for each guest travelling to Malawi and Zambia. These packs outline the geography, history and politics of the region as well as providing key information on the social, economic and environmental issues of each place or project our guests visit. Through our time as lodge managers, we realised that people want to learn about the local environment and even saw it as a traveller’s responsibility to educate themselves on the places they were visiting. As a travel company within Africa, we also have a responsibility. We act by providing environmental awareness courses for our suppliers and the corporate market within Malawi as well as for our drivers/guides. Through these training courses, we are trying to ensure that local Malawians have an opportunity to teach others about conservation and environmental degradation and educate themselves on ways they can practice more environmentally friendly practices at their work place. During one of our driver-training sessions we were discussing environmental sustainability and the importance of protecting our environment for future generations. A few of our drivers struggled to link their future generations with our view of protecting the land and in particular conserving the wildlife. They appeared far more convinced when we explained issues such as deforestation and depletion of Malawi’s natural resources and how this would affect crop production and land use over the coming decades and within their children’s lifetime. We would like to think that conservation efforts, in particular National Parks, will be for the future generations of local people. However, I can’t help worrying that the conservation efforts of today will protect a wilderness designed for the tourist and not for the local African. Is this an economical decision? Where the tourist is able to bring valuable capital to the equation, a local Malawian farmer cannot and therefore unknowingly becomes the lowest common denominator. What we hope is that both generations will benefit and our environmental education work is striving for just that, the training of local Malawians hand in hand with international visitors. So what are the responsibilities of tour operators within Africa? Is promoting ‘eco-tourism’ enough? The ‘sustainable tourism’ model is being criticized and dubbed as a new form of colonialism, which imposes conservation on people living at the economic margin, does it lead to a new form of dependency or is it truly an opportunity to break the vicious cycle of poverty? International models of community and tourism development, in particular in the Dominican Republic and China, could provide ideas and useful policy suggestions to the travel industry and governments. In the Dominican Republic the government has tried to ensure that the communities receive benefits from the National Parks from the outset. Alternatively in China many communities receive direct compensation from conservation areas and although they have not been involved in the initial decision making process, they remain fully supportive of the initiative. In both these cases, peaceful relationships have been established between conservation areas and local communities. Within Malawi and in other areas of Africa the history of the land and the people often dictates changes to lifestyle. Therefore a tourism model, which allows for adjustment from situation to situation, may be the way forward and perhaps that needs small operators to work side by side with communities to ensure mutually beneficial initiatives. This would necessitate the travel company to be based within the destination country to ensure that there is updated local knowledge and close links with community projects. Ecotourism is trying to link the tourism industry with the development movement by ensuring that economic benefits reach the host communities. It is not yet clear whether the tourism industry has the ability to make a considerable impact on poverty alleviation. To achieve this, there needs to be a synergy between the different stakeholders and the dictates of environmentalism. Perhaps the first step is to begin by looking at the differing motivations of these stakeholders. Our company has chosen to work with a small number of established community led projects and by having less stakeholders and treating each one independently, our model has thus far remained sustainable. By living within the destination country, we are able not only to build direct links but realise the needs and dependencies of each community and project we support. This is not an overnight job, but a long term plan which involves us to be committed and willing to listen and continually develop the product we are selling. We are constantly exchanging best practices within the local and international market through organisations such as Sustainable Travel International and in this way we are able to provide experiences that are equally beneficial to both our guests and the communities they visit. We have decided to keep our company small and work with private organisations and support small-scale community run projects. We are very aware that the field of sustainable travel is yet to be fully understood and we want to make sure we take it piece by piece. As much as our safaris educate our guests, we too are constantly gaining new knowledge and meeting new people who are influencing the way we look at the field of responsible travel. Although it is a conundrum, we have moved forward knowing it is healthy to question, knowing we are ourselves visitors and realising that education is the key to sustainable tourism.